History Theatre's new original musical Glensheen was such a hit last fall, they brought it back this summer. If you missed it last time around, now's your chance to see this clever and wickedly funny musical. And even if you did see it last year, it's definitely worth a second viewing; I enjoyed it even more the second time around. They've brought back the original cast, a talented, charismatic, and hard-working ensemble of just seven actors who seem like more, who are if anything even more comfortable and playful in their many roles than they were last year. Sitting up in the balcony this time, I had a bird's eye view of the action and was even more impressed with this cast, the set, the lighting, the band, the sound, the costumes, and the way every element of production comes together to tell this truth-is-stranger-than-fiction story of Minnesota's most notorious murder mystery. You have until the end of July to see this fantastic new creation and tickets are going fast - don't miss out a second time! And keep reading for my full thoughts on the show from last fall. Americans love a good true crime story. And truth doesn't come any stranger than the story of the elderly heiress and her nurse who were murdered in Duluth's most famous mansion. The murder weapons: a silk pillow and a candlestick. The murder location: the old woman's bed and the grand staircase, where a violent struggle occurred. The prime suspect: the heiress' son-in-law, allegedly acting out the wishes of her daughter who was desperate for money to feed her insane spending habits. The key evidence: an envelope mailed to the son-in-law from Duluth containing a valuable stolen coin. The result of two of the most sensational criminal trials in Minnesota history: both suspects go free, one to later commit suicide, the other to leave a string of suspicious deaths and fires in her wake. I mean really, you cannot make this stuff up. Truth is indeed stranger than fiction. What better subject for a new musical at the History Theatre, known for developing new work that explores important events in Minnesota history? This bizarrely fascinating story practically writes itself, so when talented and prolific Minnesota playwright Jeffrey Hatcher applies his biting and clever wit to the story, along with songs from the famed Minnesota musician Chan Poling of The Suburbs and The New Standards, what you get is dark comedy-musical gold. 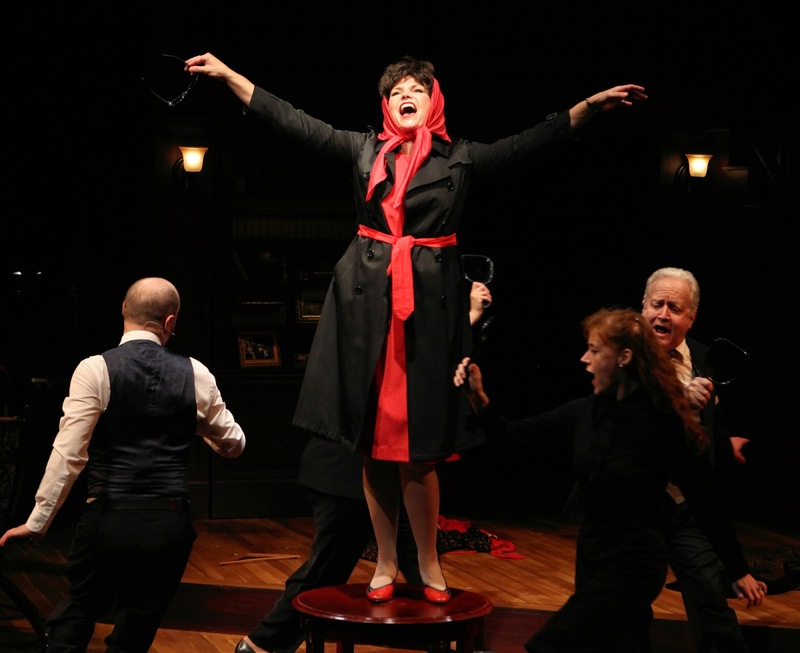 The potential was there at the reading of the new musical last year as part of History Theatre's annual "Raw Stages" festival, and it's a pleasure to see how that potential has blossomed into a fully formed piece of music-theater. It's dark and delicious, hilarious and musically entertaining, poignant and tragic. If you're not familiar with the story of Chester Congdon, the East Coast lawyer who very wisely invested in iron ore in late 19th Century Duluth, you should visit the grand estate on Lake Superior that he built for his family (wife Clara and seven children) and left to the University of Minnesota - Duluth upon the death of his last child. Which happened to be his youngest daughter Elisabeth, who never married and lived at Glensheen her entire life, adopting two daughters with whom to share her life, love, and fortune. It's her daughter Marjorie (named for Elisabeth's beloved older sister) upon whom this little tale hinges. Diagnosed a sociopath as a teenager, Marjorie had an insatiable spending habit that put her in constant debt and eventually, allegedly, led her to convince her second husband Roger Caldwell to kill her mother in order to receive her inheritance. The details of the story are too strange to be believed, except, of course, that it's true. 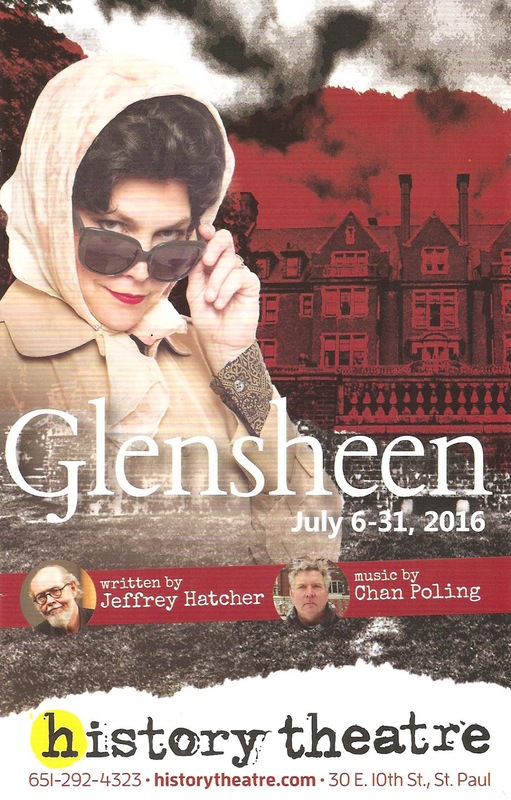 The musical begins on a modern-day tour of the historic Glensheen mansion. The people on the tour become a little too curious about the famous staircase and the tour guide tries to steer them towards the architecture of the house, but to no avail. This fabulous cast of seven then leads us on a tour of bizarre and tragic life of Marjorie and those around her. The musical stays fairly close to the facts of the case, although of course some is conjecture or rearranging to make a compelling story. But don't worry, at the end of the show they tell us exactly what was made up and what wasn't*. It's all very tongue-in-cheek and darkly comedic, done in the heightened reality style of musicals, but with some grounded and poignant moments that remind us these were real people who suffered great tragedy. The tone walks the fine line of being campy, funny, and outrageous, while not disrespectful to the lives that were lost. The show engenders sympathy not just for the two women who died that night, but also Marjorie's husband Roger, who certainly didn't know what he was getting into when he married her, and perhaps even Marjorie herself. Perhaps. Rick Polenek's rich set looks like a mini-Glensheen, a reproduction of the famous staircase leading up to the stained glass window on the second floor, with stately furnishing and lush carpeting that extends into the audience. Director Ron Peluso and his cast make great use of the multi-level stage and the aisles in the audience, drawing us into the story, even at one point using us as potential jurors. Musical Director Andrew Fleser (whose piano is dressed out as a bar) leads the just barely visible band through a really great score with big ensemble numbers, soaring ballads, quiet plaintive songs, and some fun and rousing songs, accompanied by Tinia Moulder's choreography. Most of the fantastic seven-person cast play multiple roles - maids, cops, detectives, lawyers, reporters, etc. - except for Jennifer Maren, who brings Marjorie to life in all her murderous, arsonous, seductive, sad little girl glory. She's an endlessly fascinating villain, the kind that you love to hate. Dane Stauffer is great as the drunken patsy Roger, without making him a caricature. We also see Roger's human side in his confession and death - just another one of Marj's victims. 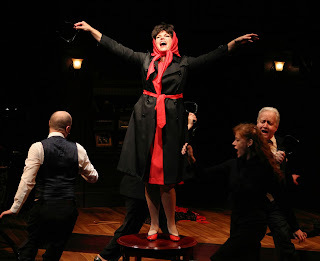 Stealing scenes in a multitude of roles, including Elisabeth, her nurse (with a sad and lovely song), and, briefly, Agatha Christie, Wendy Lehr is a delight to watch, most especially in her gleeful turn as a rock and roll defense attorney who may or may not be known "Beshmesher," shimmying her way through a rollicking defense of Marjorie. Ruthie Baker, Gary Briggle, Adam Qualls, and Sandra Struthers Clerc gamely jump into whatever role is asked of them, and the seven-person cast seems much larger with all the characters in the story. The costumes (designed by E. Amy Hill) help define the various characters and place it in that '70s/'80s timeframe. Marj's wardrobe is particularly fabulous (I'm not sure the real Marj is this fashionable), always in red, reminding us of the blood and fire she leaves in her wake. Barry Browning's lighting design bathes the stage in a red glow when appropriate, as well as creating some startling lighting strikes. *If this story fascinates you as much as it does me, I highly recommend the book Will to Murder, written by former Duluth crime reporter Gail Feichtinger with input from the lead investigator and prosecutor, so it's chock full of details and evidence.